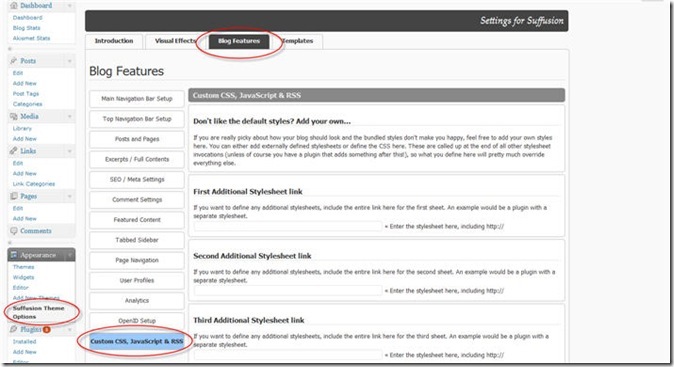 Update: With release 3.7.5, the path to the options is Suffusion Options → Back-end Settings → Custom Includes. When I clicked on “Upgrade” I got a message saying that all my changes will be overwritten if I upgrade. Is this true? I don’t want to lose hours of work that I put in to customize my site. The answer to this question really lies in qualifying “hours of work”. If you have spent the hours modifying the CSS and PHP files in Suffusion, then you are out of luck. You will indeed lose hours, which is a shame because all your CSS changes are absolutely unnecessary. A nice standards-compliant browser, preferably Firefox or Chrome. Though there are other standards-compliant browsers, I would recommend these because of the wealth of extensions. At least one of these Firefox extensions, if you are using Firefox: Firebug or Web Developer. Both tools are awesome, though I have a slight preference for Firebug because it seems more concise. 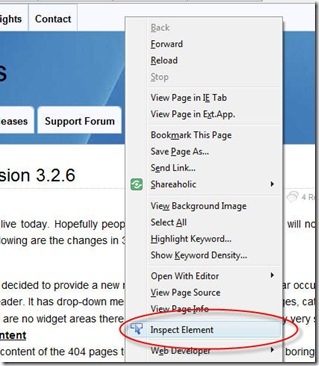 If you are using Chrome, you are good to go because Chrome offers an inbuilt feature called “Inspect Element”, which you can see upon doing a right-click on any page element. For people with difficulties switching to the better browsers and still stuck with IE, IE has an extension called DebugBar. You don’t need to edit ANY CSS file to change the look and feel in Suffusion. There you will see an option called “Custom Styles”. That is where you can put in all your CSS tweaks. This block is called last when Suffusion is being loaded, so if you want to override any of the theme’s styles your best bet is to put in the styles here. Of course, you might have a plugin that does its own fancy things and overwrites Suffusion’s styles, and if that is the case then you will need to badger the plugin’s author for information about changing a style definition. But for everything else, this little option will suffice. The good thing is that all my changes are stored in the database and not as files. So even if I upgrade my theme I am covered. One of Suffusion’s active contributors in the support forum, Connie put together a very descriptive article on the same topic, but using Web Developer as the extension. Thank you very much. You gave me enough guidance to fix two nagging issues on my blog. Awesome tutorial though! Maybe that’s where this entry should be? 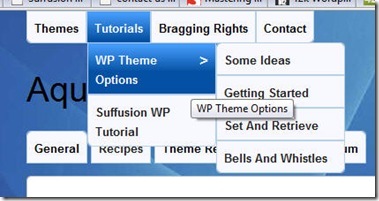 It really helps people understand how your theme works and some of it’s advantages. Also, I’ve not used Firebug before. What a great tool!! Thanks for everything Sayontan!! Actually, now that I look at this post more deeply, it seems like there’s a bunch of “>” in the code that I don’t see there in this theme anymore. Maybe this post needs an update of sorts? Thanks. The “>” is very much in use, though, on this very page. You can look at the source code for this page to see how. The spacing between the “Announcements”, “Themes” and “Tutorials” is governed by this code indeed. If you are using Firebug, select one of the “li” tags instead of the “a” tags – you will see the usage. In fact, the entire code in this tutorial is used for the setup of this site. I’d like to add a background to the Top Navigation Bar. How could I do that? WOW! I just gotta say the Suffusion Theme destroys anything else out there! Thesis? pffft… toss that in the garbage Suffusion crushes it! Forget a cup of coffee my friend, I’m sending the Maxwell truck to your office! thanks for the info – i have always suffusion as i think it’s the best out there! I should have place the coding above in Custom Includes but i edited some php file in the editor and dont remember which. can anyone tell me which php file it should be? I am fairly new to WP and themes but I’ve gotta admit I’m loving Suffusion so far, I think I made the right decision in going with it. A small question if I may, can you explain the benefits / differences with using custom css as opposed to a child theme? If your only desire is to change look and feel aspects of the theme, the Custom CSS is fine. If you want to do PHP edits / BuddyPress or e-Commerce support / multilingual sites, then use a child theme. Thanks Sayontan, you are an I.T God! haha, I have quite a few things I’d like to implement and I’ve been researching Custom CSS vs Child Themes, as it is I think I need a child theme…however having read through your release notes for v4.0 I think you have covered almost everything I need in there! Can you give us a clue as to when it will be available?? I am working towards finishing it. It is a lot of work. Can you please tell me how to set a fixed width for every menu Item in the navigation bar(Top Bar)?